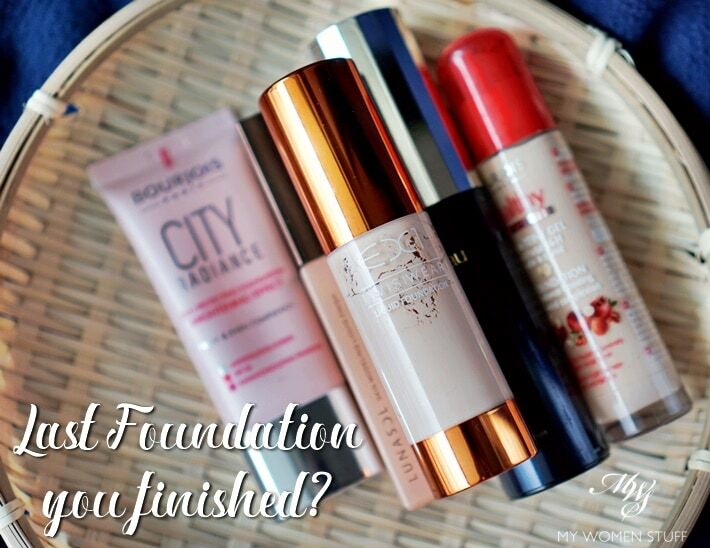 Home » Face » Foundation » Your Say: What was the last foundation you finished and would you repurchase? 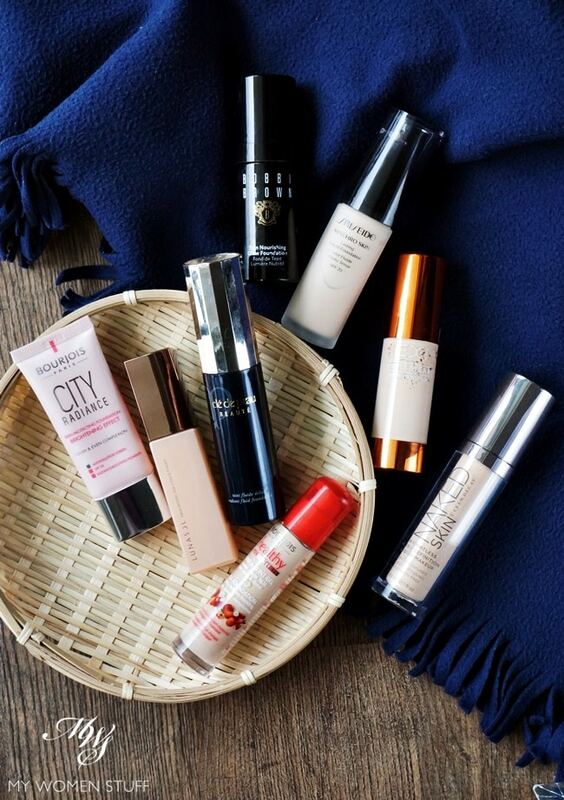 Your Say: What was the last foundation you finished and would you repurchase? Last week, my friend sent me a picture of a finished jar of foundation. It was scraped clean. Every last bit had been used. I was very impressed. So I got to thinking – What was the last foundation I finished? What impressed me further, was when she told me that she would repurchase it, because she was so happy with it. And I wondered again. Was there a foundation I loved so much I’d finish it AND repurchase? Another foundation I can forsee myself finishing is the EX-1 Invisiwear Liquid Foundation which I’ll tell you about another day. I enjoy using it, and it is one that I will eventually run out of. I’d actually be more than happy to finish and repurchase these foundations that you see in the picture above. I’d shared with you previously, a post about my favourite foundations, and most of them are featured here too. I never blogged individually about the Urban Decay Naked Skin foundation but it’s one of the better products I’ve used from Urban Decay. And the Bobbi Brown Skin Nourishing Glow Foundation and the Shiseido Synchro Skin Lasting Liquid Foundation are both fairly new, but very nice products. Have you finished any foundation recently? Would you repurchase it? I think I’ll pull out 1-2 of my favourite ones and use them exclusively till I’m through. Or until I get bored. Whichever comes first LOL! Now, your turn – tell me what’s the last foundation you finished and if it’s something you’d buy again? Last foundation was Parure Gold by Guerlain. I loved it so much but didn’t want to repurchase because of the price. Got myself the a Chanel but regretted because the tone is pinkish. But I have to live with it because I no longer believe in spending too much on makeup. OMG I loved the texture of Parure Gold at the counter, but when they told me the price, I felt faint LOL! Guerlain foundations are very nice too I’d agree. But so luxe, even the price is luxe. Sigh… Maybe can try Bourjois next? It’s fairly affordable (often goes on sale) and is very good! Last foundation was G.A Luminous skin. I will repurchase it, but after I finish my other foundations. btw, YouTube don’t send me notifications for new uploaded videos anymore (notification bell is pressed), I must search each channel, one by one, for new videos, any idea? My Becca Aqua Luminous foundation is finishing soon and I will repurchase. I just love how it made my skin (as stated on the bottle ) luminous. Love it. Ooh Iza, I’d been curious about this one! Was tempted to pick it up a little while ago, thanks for reminding me haha! It ‘s winter here in the UK and i have just finished the Dior Star foundation. I absolutely love wearing this one in the winter time. It’s coming into Spring now and i will re-purchase it; however, i do not use Star in the summer because my skin is quite a bit oilier through the t-zone so i either powder foundation through the t-zone or my Chanel Perfetion Lumiere Velvet. This is more of a medium coverage and stays put quite well. I have repurchased this one twice as well. I want to try out the Dior Airflash foundation next to wear with my powder foundation in the summer. We shall see. Oooh Dior Star, that’s one from Dior I wasn’t smitten with but hearing that you love it in Winter makes me wonder if that might be why. A friend of mine loves Dior Airflash, but application can be finicky due to the spray and all that. I haven’t tried it myself. Wasn’t sure I was ready to get foundation over everything I own haha! I just wanted you to know that i bought the Dior Airflash Foundation and i absolutely love it. Great for maturing skin like mine because it really does give that airbrushed look and no settling in any lines. I don’t spray it all over my face rather, i take my full coverage foundation brush ( an ordinary one will not work) and Sray it onto the bristles and then blend into the face. Giorgio Armani Maestro Fusion in 5.5. I’m 63 so it’s a little drying in the winter, but I just mix a drop of Kiehl’s Midnight Recovery Concentrate into it before I apply and I’m good to go. It’s very skin-like and gives a blurring effect so that my pores are invisible. The coverage is on the sheer side, but I hate a foundation with too much coverage – I tend to go to the natural look. That’s a clever tip to mix a drop of oil into your foundation for a more comfortable wear, Deb 🙂 I sometimes do that too for my more drying foundations and it makes them wearable. I haven’t tried Maestro myself although I’ve heard lots of good things about it. I wish GA would return so I can try all their amazing bases! For me, it’s Sofina Prima Vista Ange Powder Foundation that is targeted for Asian females in humid weather – it does seem to be least pore-clogging and least likely to lead to an oxidised oily look before the day is up for me at work. LOL we share the same roving eyes for foundation. I’m always eyeing the next new one, never mind I have a drawer full at home! Ooh you reminded me of Guerlain Lingerie de Peau. It’s so good! I do find Guerlain foundation coverage to be quite high, which might be why I stopped using it for a while. But I’m going to dig up mine! I’ve used about 90% of my bottle of Chanel Perfection Lumiere Velvet and I will finish it and repurchase it. I have tried so many high end foundations over the years (too many years!) but this is the creme de la creme in my opinion. It’s not heavy or thick but does a great job of evening out my skin, toning down any redness and I find I need very little powder on top, which is a bonus. I just hope it’s not discontinued at any point because it’s my HG. Good pick Tubbs! I love that UD one too – it’s so comfortable to wear and for me, the shade is a perfect match! Hmmm your friend sure is dedicated to her favourite foundation ? It feels like I’ve picked up the last bit of Helena Rubenstein this morning. I’m almost done with our twin favourite Cle de Peau. And I’m about halfway through my koh gen do. These are all current favourites picked up from travels and not found in Australia. I’m hyperventilating at the thought of having to replace them. Another one I have managed to empty was the Shu Uemura Lightbulb foundation, which was honestly, a little handful to apply to me but I still managed to finish it. Haha. I haven’t tried the Laura Mercier Candle Glow foundation but I’m with you on the rest! Good stuff! Sighhhhhh…….. At any given time I have nearly 20 foundations/BB creams/CC creams in rotation. Most are really good and I would love to repurchase but I have only 1 face and so many more foundations to try ;-). However, the last foundation that I have consistently repurchased was from Prescriptives. And since they are no longer available easily, there goes that. Perils of a beauty junkie! 😀 I totally feel you – no rational person has a drawer filled with just foundation bottles 😛 Gosh, you know what? I haven’t heard Prescriptives in ages! I’d never tried their stuff but I remembered people raving about their foundations where you could get them custom blended or something. Makeup Forever Ultra HD, Armani Luminous Silk, Koh Gen Do Aqua (unfortunately not available in Switzerland… but I will certainly repurchase next time I’m in Japan). And Iope Cushion (also not available in Switzerland). Ah another vote for Koh Gen Do Aqua! I was just telling another commentator above, that I bought the one in the red tube and am not crazy about it. I should have bought the Aqua version 🙁 We don’t get it here either, only in Singapore, so that’s that! Koh Gen Do Aqua is a dupe for Luminous Silk, although it’s not silicony. But the finish is very much alike. It looks like I’ll have to find a way to get hold of it! 😉 Thanks! I have the same love for Lunasol Skin Modeling Liquid Foundation. However Kanebo counter has discontinued this range and they replace by their own Kanebo foundation. I bought their Kanebo Full Radiance Liquid Foundation. The finishing almost like Lunasol but the texture is more creamy ,a bit thicker but it provide a brighter radiance finish than Lunasol and pretty long lasting. Perhaps you can have a try on it and hope you will like it . Hi Jazlyn, I came across rumblings that Kanebo had rebranded Lunasol, but also a comment that Lunasol was still around, and Kanebo was a separate brand! I”ll have to find out a little more. But thank you for sharing with me about the Full Radiance Foundation. I will have to take a look the next time I’m at a counter, as I love Japanese base makeup – they truly are the best! On the bright side, you know you can always depend on Laneige BB Cushion! LOL I haven’t tried the anti-aging one yet but I’ve heard that it’s pretty good compared to the regular ones! I have finished and love Borjouis red cap (the one with serum on its name). Alas, repurchasing has been impossible, it somewhat like hunger games to find that product in my shade. I’ve been using Borjouis CC cream and like it well enough. Good at evening my skin tone, sheer to medium coverage, looking like 2nd skin. The price tag isnt so horrid for daily wear, which is a plus. Same problems with shade and hunger games hunting tho. Wonderful. Been in love again with Lucy Minerals powder foundation. Look like skin and decent coverage. Plus it settled beautifully. But dear Jove, it transfer like lice in toddler daycare. But i do love love how it looked like on my skin…..